The best way to get rid of ants coming from the vents --or anywhere else -- is to avoid giving them a reason to enter your house in the first place. That means cleaning floors and counters and putting food away as soon as you are finished eating. If ants continue to bother you even when you clean regularly, you can deter them or kill them with sprays or powders. The most effective way to exterminate them, however, is to bait them. You may also have to clean and insulate the vents to control moisture that attracts the ants. Ants coming through the vents are probably after food you left out. All are attracted to sweets, but carpenter, grease and pharaoh ants prefer greasy foods, so a bait to attract these species should include something oily, such as vegetable oil or peanut butter. You can distinguish ant species by size, coloration and body type. A number of online resources are available to help you do this. Stir until all the ingredients are dissolved, then pour the liquid into a small bowl and set it near the vent. To help the ants reach the bait, it helps to place a paper towel in the liquid and let it hang over the side of the bowl. It's important not to overdo the boric acid. It should be in a low concentration -- about 5 percent -- so the ants can take the bait back to the nest and feed it to the colony without dying first. If the ants swarm around the bait, it's probably working, and if so, the ant population should decrease and disappear in about a week. The inside of the vent may be damp and dirty, and that may be why the ants were attracted. Once the ants have disappeared, use soap and water to clean dirt from the vent walls as far in as you can reach, then dry the walls with a rag. If moisture is a recurring problem, you may need to insulate the vents. This will also help control mold. Microscopic food particles easily find their way to the floor, especially in a house with children or pets. You may not be able to detect them, but ants can -- and the food particles attract the ants like a magnet. Vacuum at least once a week, and wipe the floor or mop it at least once a month. 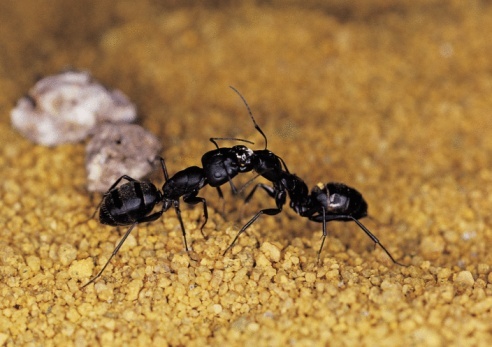 Baiting is the most effective way to control ants, but it takes time. If you want the ants gone yesterday, you can stop them in their tracks by spraying them with orange oil. This spray is available commercially and can be used around food. It is safe for children and pets, but deadly to ants and other insects. Spray it liberally around the vent cover and on the floor. It keeps ants away for two or three days, and sometimes longer.